A compression spring is a spring that will produce linear force by pushing back against forces that are applied to it. A weight or force will cause the compression spring to compress down, and if the spring is designed correctly the spring will push back against the weight causing it to return to its original state. Think of a common example like a pogo stick. When you apply your weight to the pedals of the pogo stick the spring will compress and when you begin to hop the spring will push back against your weight propelling you off the ground returning the spring to its original state. This motion is repeated every time you hop off the ground. Acxess Spring is one of the leading coil and conical compression spring manufacturers in Southern California and around the globe. We are one of the few compression springs suppliers that offer helical, stock, custom, and conical compression springs of at the highest quality, have 5-day lead times on custom springs, and a 15-day satisfaction guarantee. Looking for technical information or help with spring design? View our compression spring technical page. Here at Acxess Spring we manufacture precision compression springs from 0.006 wire diameter to 1.00 inch in wire diameter. We make large compression springs, small compression springs, as well as conical compression springs. 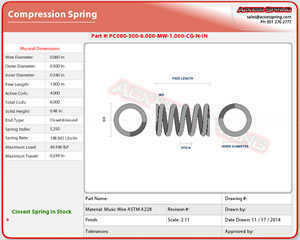 Acxess Spring specializes in spring custom work and in lowering your cost on stock spring orders of 150 pieces or more. No compression spring supplier will beat Acxess Spring's level of expertise, spring design knowledge, lead time, pricing, or customer satisfaction. Acxess Spring has engineers that will work with you on your compression spring design to make sure that your spring is perfectly engineered to get you the best compression spring at the best price possible. Sometimes something as simple as switching from a stainless steel compression spring to a music wire compression spring will save you hundreds on your conical compression spring purchases. Acxess Spring can work with you on creating the exact custom spring you are looking for. As you can see from the images below we can have multiple closed coils at one or both ends of the spring to add extra support to the spring if it is going over a shaft. We can also manufacture springs with large amount of pitch allowing you to generate a lot of force in a small amount of travel. You compression spring can also be customized with multiple outer diameter creating a cone, barrel or barbell shape on the spring. We have many satisfied customers who have wonderful things to say about the work done by Acxess Spring and the money we saved them. Customers who previously had shopped out of a compression spring catalog were extremely impressed when they discovered they could save 30% or more by switching to Acxess Spring. Acxess Spring has a wide range of springs in stock that we can have shipped to you in 2 business days eliminating the lead time on custom springs. On orders over 150 pieces, Acxess Spring can save you 30% or even 50% off what you were previously paying for stock springs. If you are looking to purchase a stock or custom spring please fill out the green quick quote on send it to our sales team. If you need prototypes or want to sample the work from Acxess Spring before you order we can help you in most cases. Acxess Spring offers free prototypes, with a pending purchase order, on compression springs with no grind and minimal cost for more complicated compression springs to cover the extra labor costs. We are here to serve you and help you through the design, prototype, and purchasing process. Our goal is to satisfy our customers and to build lasting professional relationships. You can read more about our helical, stock, custom, and conical compression springs online through this website. If you are looking to buy helical compression springs, conical compression springs, stock compression springs, custom compression springs, or any type of coil compression springs Acxess Spring is your one stop shop for compression spring supply.